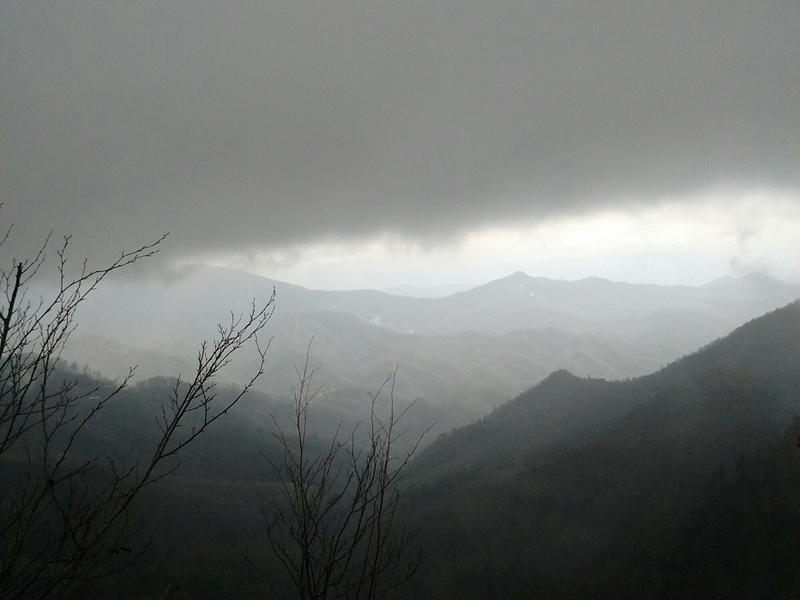 We tried to outrun a storm to Nantahala and lost. But we dodged a cold night that lurked behind it…tucked in warm and comfy at our friends’ house in Bryson City. The low point for me occurred on the endless approach to Wayah Bald. It was the end of an 18 mile day. Pouring rain. Wind. We just wanted to top the bald and find a camp site, but the trail had other ideas. We hit a slick stretch, an evil product of a recent fire, and Sarah fell. My mind went into a tailspin: how much more of the trail would be like this? Would Sarah keep falling until she hurt herself? How could I keep her warm during the hours it would take for search and rescue to reach us? It was way too steep and rocky to pitch our tent. We continued, trying to keep our feet under us, concentrating on the feel of the uneven, slippery muck. Finally, across the burn and climbing once again on leafy tread, a movement ahead startled me. A black shape, size of a big dog but way too stocky. Peering through the rain and mist, I saw a wild boar with two young. They were busily rooting for acorns, snuffling snouts plowing the leaf litter. Their nonchalance in the storm bolstered me. Sarah hadn’t fallen again. We would make it…eventually. And we had been blessed. Wow – what an interesting day that was! Glad you survived a storm and a boar family. Sarah, we your handbell buddies in Maryville, are following along. I am enjoying your adventures from the security of my nice friendly home, but I admit that part of me is SO envious. Be careful out there! Thank you, Amy! I’m so glad that you are enjoying reading our adventures. We’re enjoying having the adventures, most of the time!